The county of Denbighshire is a relatively small county in north-east Wales and claims the title of the most inhabited district in Wales. Extending inland from the Irish Coast, Denbighshire rests between the provinces of Flintshire, Cheshire, Caernarfonshire and Merionethshire. The county comprises of a calm coast stretching from Dee to Colwyn Bay which houses numerous pocket-friendly resorts. The inland terrain is mostly farmland which becomes more low-lying as it moved towards the beach. Head southward for picturesque villages and rolling countryside. If you’d rather vacation in the mountains, turn your motorhome hire towards the south and west of the county where the land rises into mountains. The county is said to be inhabited over 225,000 years ago, and Bontnewydd Palaeolithic site located near the city of St Asaph in Denbighshire is one of the most significant sites in Britain. An important trading route to North Wales cut across the county and was also the location for two Roman roads. King Edward I erected many castles in Denbigh and Ruthin. Denbigh Castle remained one of the final Welsh forts to submit to parliamentary forces during the English Civil Wars. Today the county contains a wealth of historical and natural attractions. Many crumbling castles like Denbigh, Rhuddlan, Ruthin, Castell Dinas Bran and Bodelwyddan dot the county of Denbighshire. Take your motorhome hire by the coast or enjoy a hike through the hills and mountains of Clwydian Rang! I am Geno, hire me today! 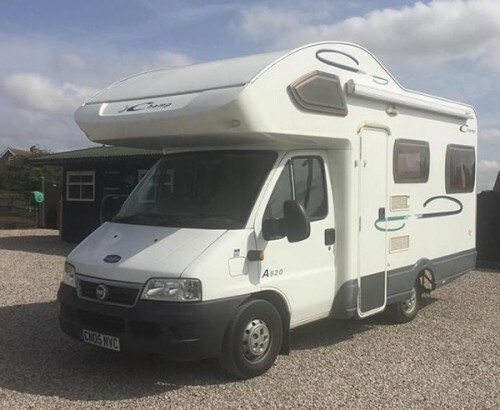 Amsden is a Fiat DUCATO 11 2.0 JTD SWB 4 Berth, 2 seat belts, Lunar champ A520 motorhome.End lounge / dining area with freestanding table also has a Tv compartment with built in power and aerial point . This area also forms a double be.